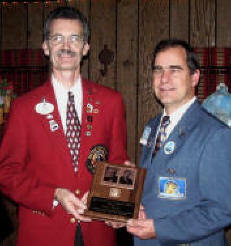 December 14, 2005 -- Wayne Bargenquast and Charles Browning received the prestigious Melvin Jones Fellowship from our club at our annual Christmas party. Wayne's wife, Kathy, received one as well from her Fond du Lac Lioness Club. Gary Colton, our current district governor, was awarded with a Birch-Sturm Fellowship the same evening by Tom Clausen, a first-year director of the Wisconsin Lions Foundation, who also is a member our club. The fellowships were presented to these three Lions by the club for their continued support to club activities and fund raisers. 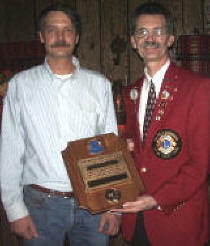 The Birch-Sturm is awarded by the Wisconsin Lions Foundation upon receipt of a $1,000 donation by the club or an individual to the foundation's endowment fund. The Melvin Jones is awarded by the Lions Clubs International Foundation upon receipt of a $1,000 donation. This year the Fond du Lac Evening Lions donated $2,000. $1,000 was earmarked for the Katrina Relief Fund. Other FDL Evening Lions that are Birch-Sturm Fellows are Wayne Bargenquast, Bob Berryman, Charles Browning, Tom Clausen and President Mike Konen. Other Melvin Jones Fellows in the club are Frank Bartzen, Tom Bucher, Tom Clausen, Gary Colton, Erv Karls, Mike Konen and Gary Silah.